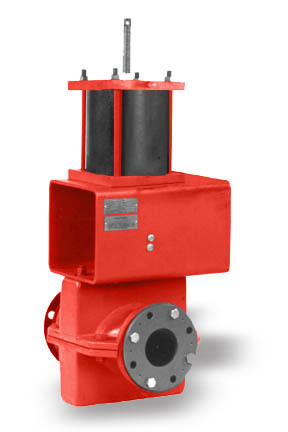 The Red Valve Series RSR Pressure Relief Valve is designed specifically for slurry applications. It is a reliable relief valve available for slurry service, venting surge pressures in the system, or to maintain system pressure. The valve operates very simply – making use of a spring loaded cylinder, which keeps a rugged reinforced rubber pinch valve sleeve pinched closed. As process pressure builds up and exceeds the tension set by the spring, the valve opens. The greater the pressure build–up, the more the valve opens. Since the sleeve isolates the process from the pinch mechanism, corrosion, bridging, plugging, and valve freezing are eliminated. The adjustment nut on top of the actuator allows for easy external recalibration. If actual system operation pressures change, the correction and fine–tuning of the system can be made by simply turning the adjustment nut. An optional accessory system for handling sustained surges is also available.